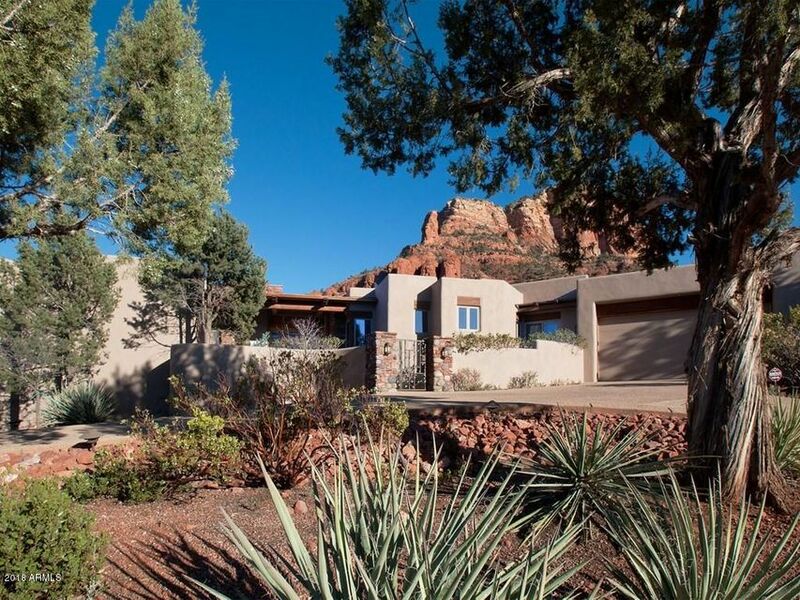 All Sedona homes currently listed for sale in Sedona as of 04/18/2019 are shown below. You can change the search criteria at any time by pressing the 'Change Search' button below. 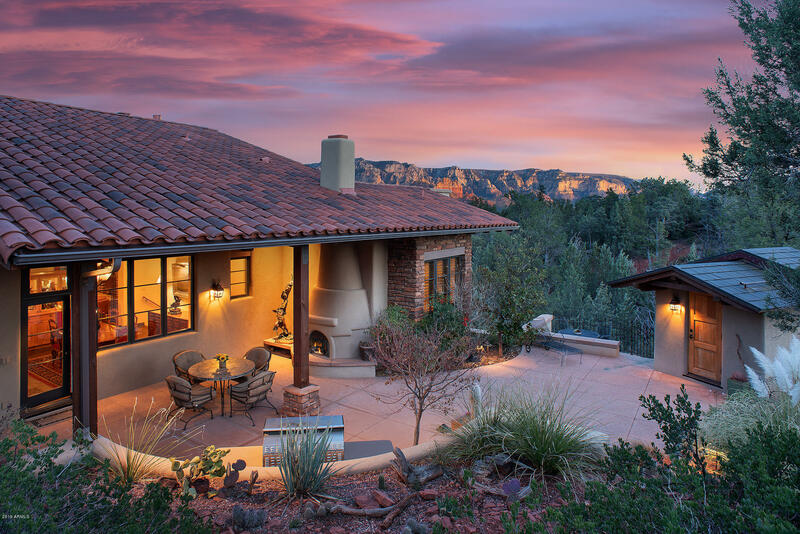 If you have any questions or you would like more information about any Sedona homes for sale or other Sedona real estate, please contact us and one of our knowledgeable Sedona REALTORS® would be pleased to assist you. 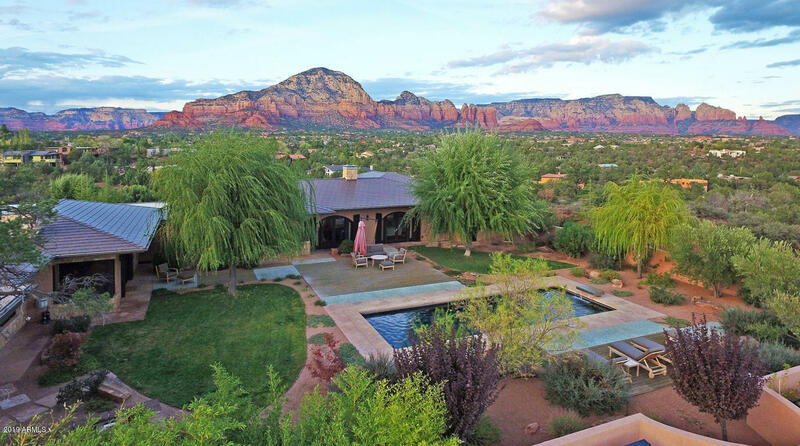 "Ten minutes from West Sedona, yet a secluded world apart from the mundane. 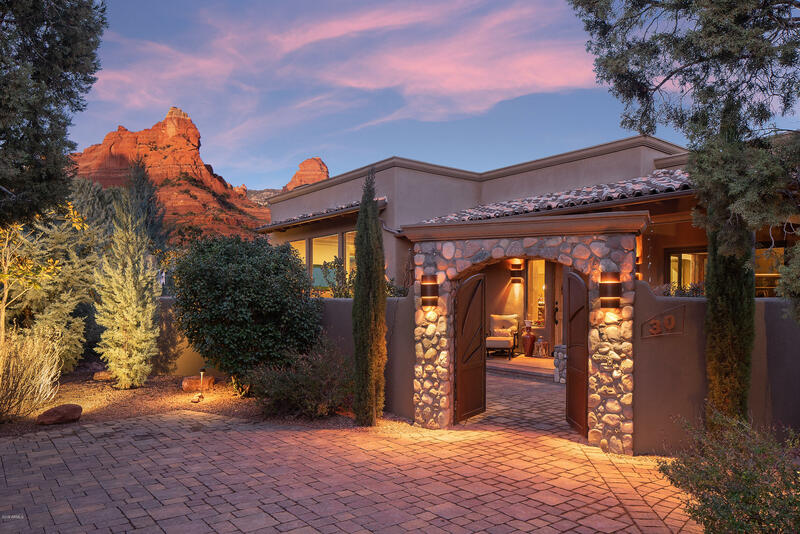 Come experience the abundant delights of this luxurious, versatile, and exceptionally private estate found at Sedona's most exclusive gated community. An 80-acre Shangri-La in the midst of the National Forest, Eagle Mountain Ranch enjoys over a half mile stretch of Oak Creek running through it. This remarkable home, one of only five in EMR, is sited on over five acres, high on Eagle Mountain overlooking the creek, meadows"
"Perched on a hilltop with elevated red rock views, this custom masterpiece designed perfectly for the two+ acres, backs to national forest and state park land, offering its new owner ultimate privacy and unforgettable panoramic views. Quality construction for the discriminating buyer, soft southwest contemporary architecture, 5,840 square feet indoors with a warm and inviting feel. Create lasting memories, experience serenity, year-round outdoor living, captivating views and a luxury home that c"
"Be embraced by beauty and serenity in this exquisite, warm, and inspiring contemporary masterpiece, an extraordinarily beautiful home set upon a secluded hilltop on 1.73 acres bordering U.S. Forest Service land in West Sedona. 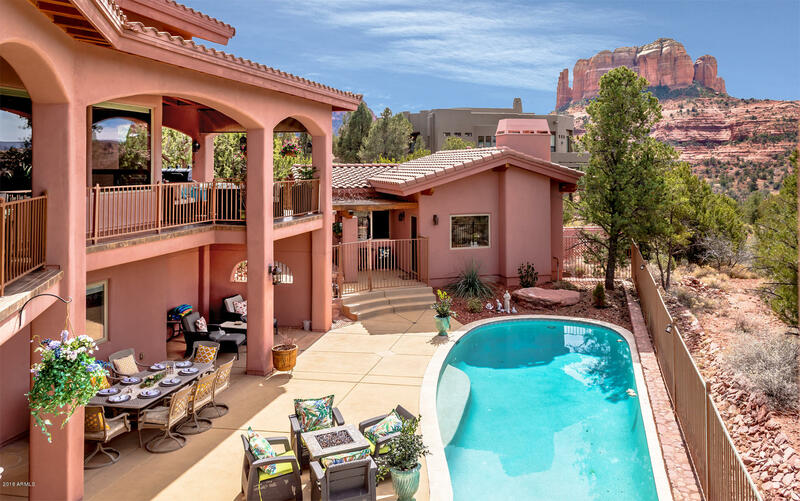 It has incredible red rock view panoramas from its private and serene setting, capturing unblockable views of Thunder Mountain, Coffee Pot, Cathedral Rock from the backyard pool area, the entire eastern red rock rim including Wilson Mountain and Giants Thumb, and much more"
"Nestled between majestic Red Rocks and dramatic mesas, 55 Sanctuary Way is truly a sanctuary for the soul. 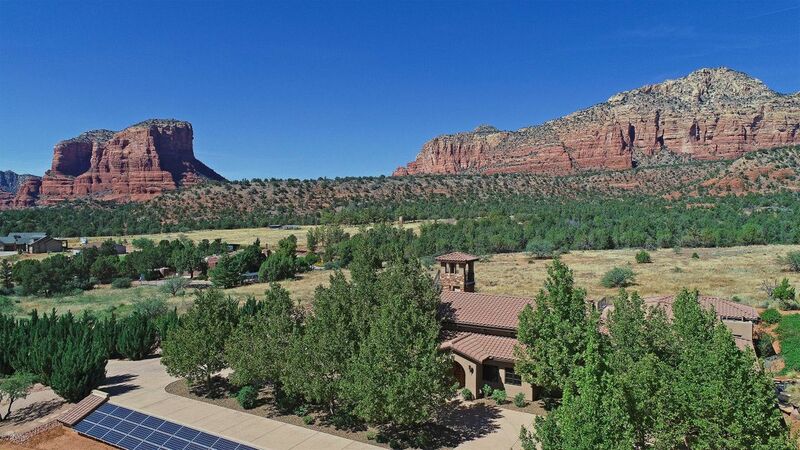 This stunning architectural gem captures the beauty of both a mountain lodge and a graceful hacienda; surrounded on all sides with vistas of some of Sedona's most iconic landscapes. Walking into the Great Room, you will be enchanted with the soaring 19' ceilings, complete with stunning wood beams and wide open views to the Red Rocks. 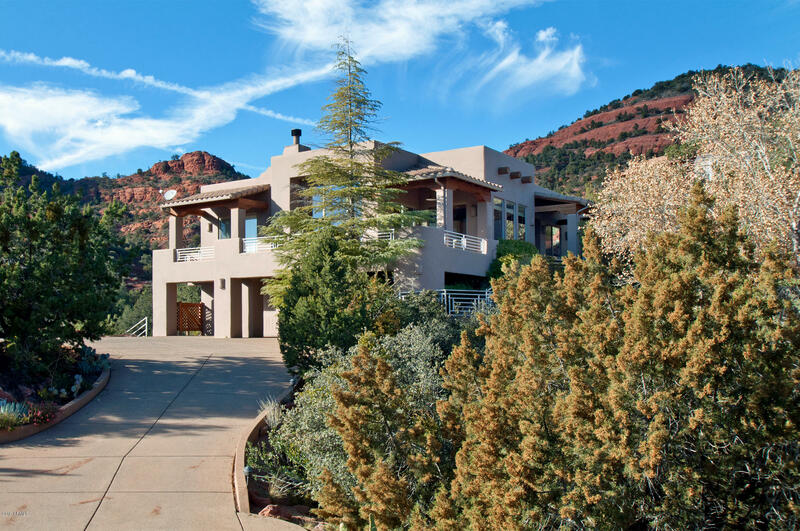 It is easy to imagine gathering around the impressive sto"
"Experience breathtaking 360 degree views from the rooftop deck of this elegantly appointed 3900+ sq ft home on 8.47 acres bordering National Forest land and nestled in the arms of Bear Mountain in the Red Rocks of Sedona. Imagine yourself under the best shower in the world outside the master suite with views of Bear Mountain, Doe Mountain, Cathedral and Courthouse! Walk on the flagstone floors radiantly heated in winter; touch the stacked stone, exposed wood beams, hand troweled Venetian plaster"
"Extraordinary Quality. Timeless Design. Ultimate Paradise. This masterpiece features 4,124 SqFt of luxurious indoor living space. Primary Residence: 3,507 SqFt. Guest Casita: 617 SqFt. Two-car Garage: 834 SqFt. Built in 2006, this custom quality home and guest casita designed for ultimate indoor/outdoor living. Offering two waterfall features, two entertaining patios at the main residence; open floor plan; three master suites (split-bedrooms); media and den; an office in the loft; gourmet kitche"
"This splendid, secluded family compound with marvelous views & complete privacy has it all. Passing through the private gate, you leave the madding crowd behind & enter a sanctuary of serenity, natural beauty, & luxurious comfort. 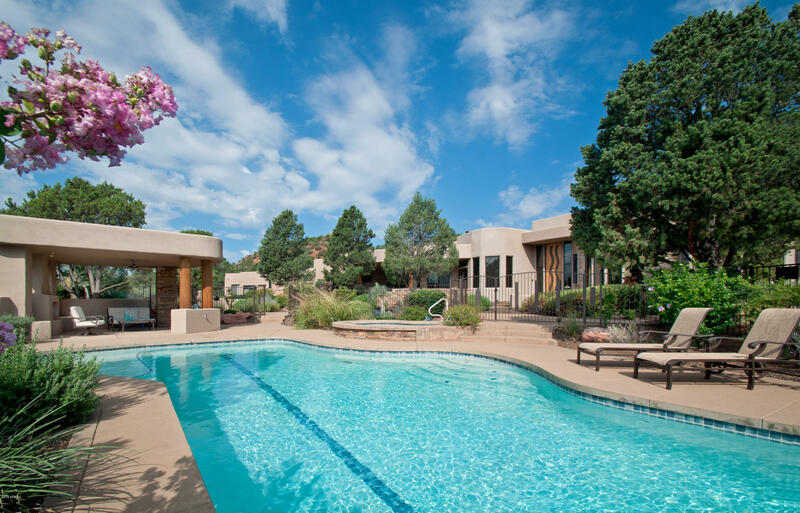 Soothe your soul with a stroll through the fully enclosed one acre property with its lavish landscaping, water features, meditation/yoga gazebo, pool pavilion, and, above all, Nature's brilliant red rock panoply. 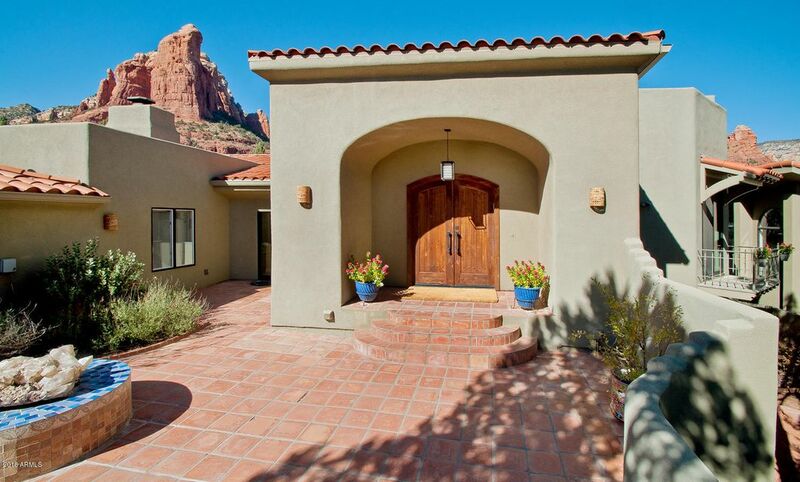 Cathedral, Bell, & Courthouse Rocks are just the beginni"
"Find contentment and inspiration among the Sedona Red Rocks in this architecturally stunning residence adjoining the National Forest in the shadows of Elephant Rock. 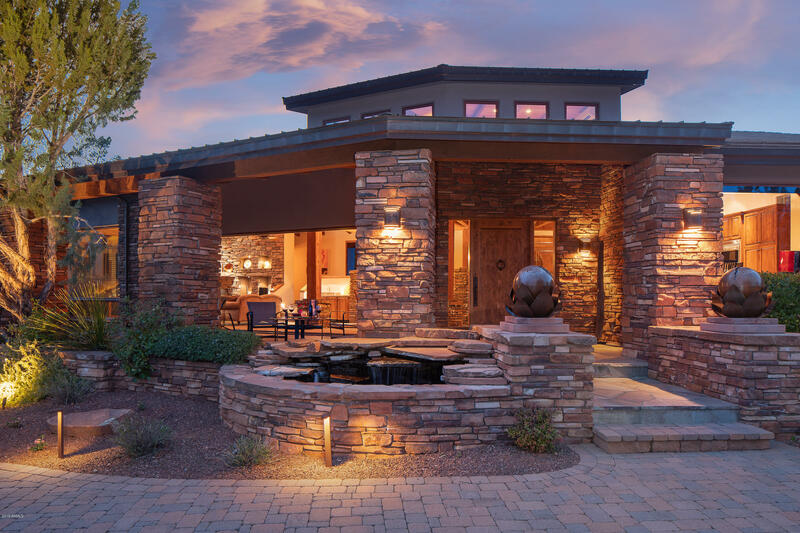 Architect, Paul Overman, created this beautiful masterpiece with custom red rock, cobble, and river rock stonework flowing throughout the home. Take in the astounding views from the grand living room, dining room, and kitchen; all with an open flow among living spaces. Built by Doug Howland, this gorgeous home features 18ft high cei"
"New build! !Not Completed. 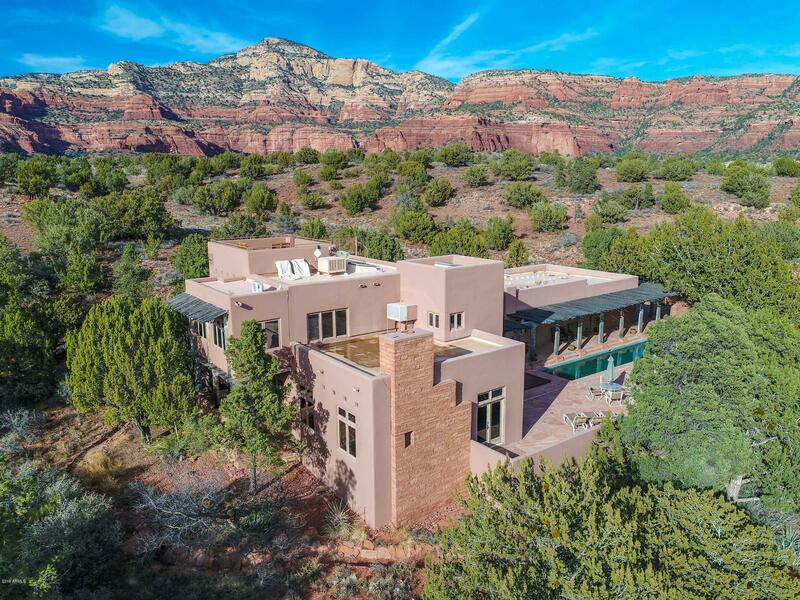 Immerse yourself in the beauty of the Red Rocks, Coconino Forest & theOld World European Architecture these Villas in 7 Canyons have tooffer!Previously available only as fractionals but now take the opportunity to purchase it as your next DREAM HOME! 3Bed/3.5Ba, each features a gourmet kitchen with Viking appliances,hammered copper sinks, private study, Venetian plaster, upholstered walls, reclaimed hardwood floors & beams & radiant floor heating. Outdoor areas include "
"Immerse yourself in a custom designed masterpiece situated on 1.02-acres, located in the serene setting of Soldier's Pass. This custom home offers impeccable hand-crafted quality balanced with exquisite Eric Brandt architectural design in harmony with its peaceful outdoor setting. Bathed in quality and luxury inside-out, this luxury home simply cannot be duplicated at this value within this premier location of Sedona. Detached from the 3,295 Sq.Ft., main residence is a Carriage House (280 Sq.Ft)"
"This marvelous estate is an artful, high tech, exquisite blend of sophisticated modern architecture and serenity-inducing natural elements that will uplift your spirits and soothe your soul. 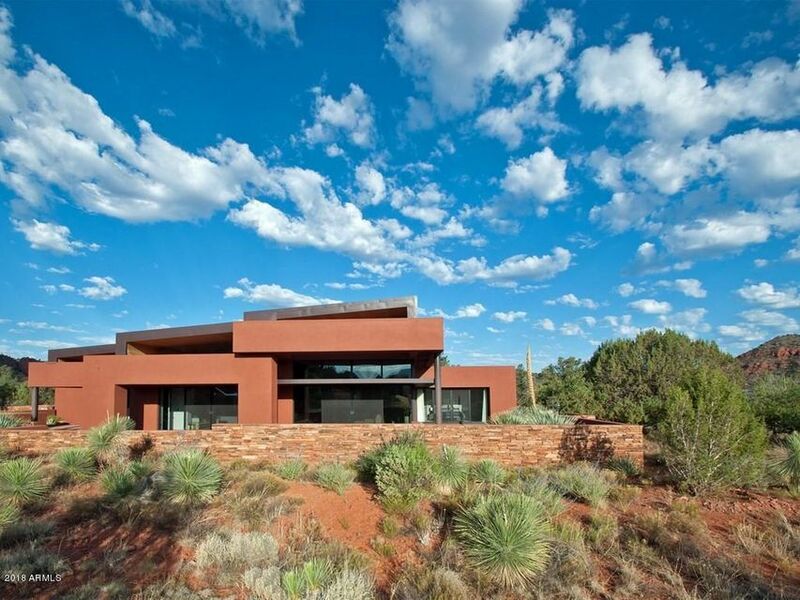 This state-of-the-art masterpiece by internationally acclaimed architect, Aldo Andrioli, is a stunning fusion of urban design with the gorgeous organic southwestern setting. 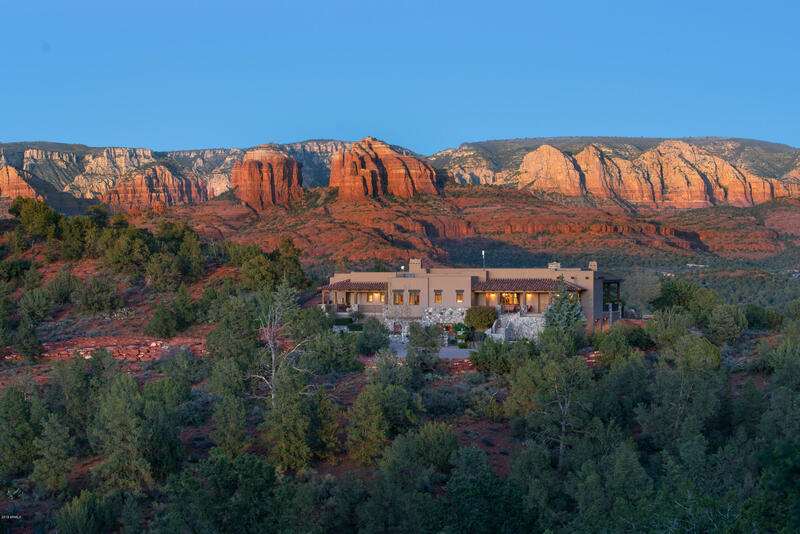 Spectacular red rock views - a panorama of Cathedral Rock and beyond - become one with the elegance of the residence, providing both co"
"This 4,300 SqFt extraordinary designer home offers its buyer a premier location, designer appointments, and is graced with majestic views. 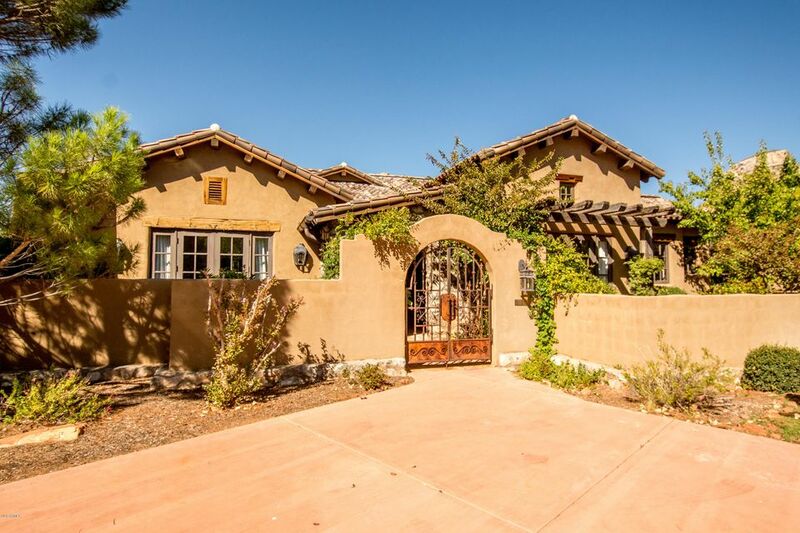 Its buyer will enjoy an in-law guest casita with its own kitchenette, living room, master suite, and deck. Office space with an exterior entry and additional spacious living on the lower level including a den, bath, and workout area (or easily convert workout space to 4th bedroom).A gourmet kitchen featuring top of the line Miele appliances, stone sink, leath"
"SELLER MOTIVATED! A SECLUDED PARADISE ideal for ENTERTAINING with spacious decks overlooking red rocks and green valleys for miles. LR features towering ceilings and picture windows. 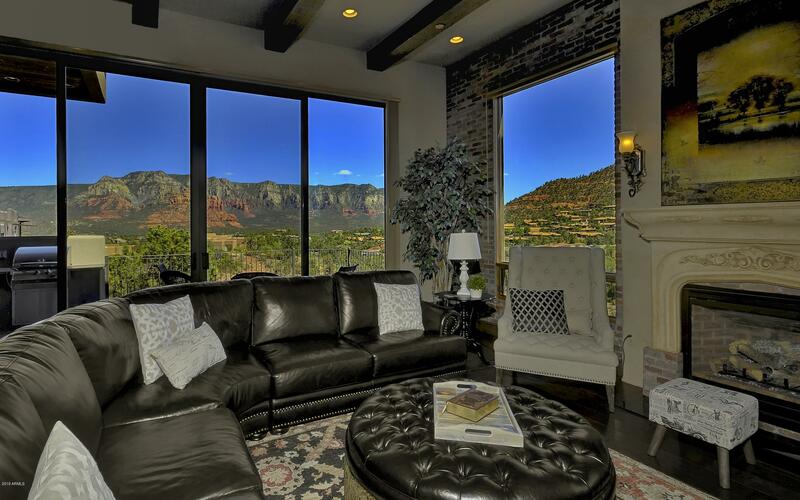 Spectacular VIEWS of Cathedral Rock from the formal DR & your beautiful DREAM Gourmet Kitchen. Main level includes: Master suite, Den, office, laundry, 2.5 baths, & 3-car garage all on main level. 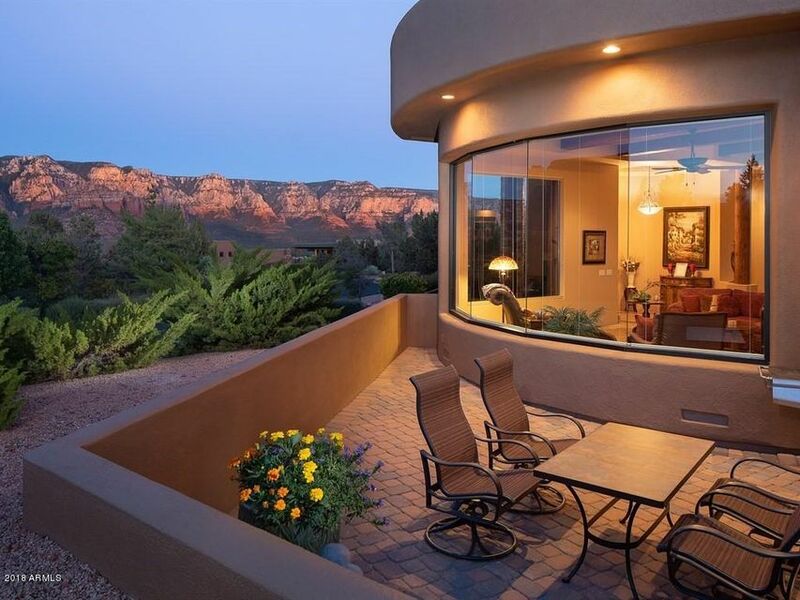 Lower level has a cozy family Game room with built-in bar, 8 chair home theater w/ 110'' screen, guest bedroom, 2 ba"
"Stunning and spectacular custom home in sedona''s prestigious and gated casa contenta, unblockable red rock and city views!! 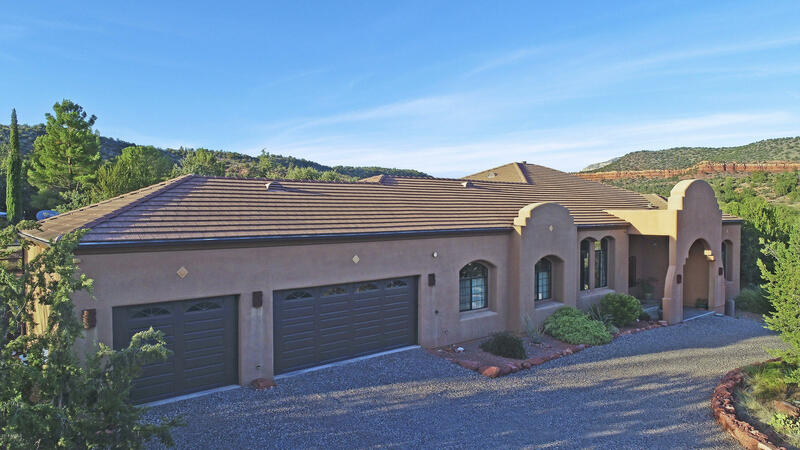 Home was built by one of Sedona''s premier buiders as own residence.Hardwood floors upgrades, thru out ,2 private guest suites with separate entrances. Home is an entertainers delight ,with romantic outdoor fireplace and lush courtyard. 2 large outdoor decks. located in desirable west Sedona close to shopping dining,movies, and hiking .Main portion of home is single leve"
"Must see! 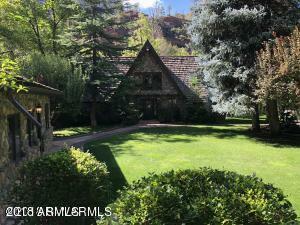 Very eclectic, unique retreat property or family compound on the creek. 10 bedroom plus 10 lofts, Certificate of occupancy for 21 ! High end finishes on 4.77 acres creek front next to new subdivision Mystic Heights. 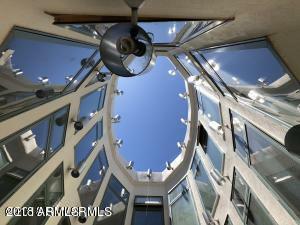 Large atrium runs thru the middle bringing natural light through out. No HOA allows for short term rental. Potential for 4 more homes (verify with county planner). Chavez rd. now paved to driveway. Amazing swimming areas on creek close by. Can be split into 5 parcels(includ"
"Enjoy the Old World Architecture these Villas in 7 Canyons have to offer!Previously available only as fractionals but now take the opportunity to purchase it as your next DREAM HOME! (only Villas A4,A7,& A8 available)PLEASE NOTE:Pictures are of Unit A4 as they are the same floor plan. 3Bed/3.5Ba, each features a gourmet kitchen with Viking appliances, hammered copper sinks, private study, Venetian plaster, upholstered walls, reclaimed hardwood floors & beams & radiant floor heating. Outdoor areas"
"Steps away from West Fork Trail, touted to be one of the best trails in Arizona and one of the top 10 trails in the United States. 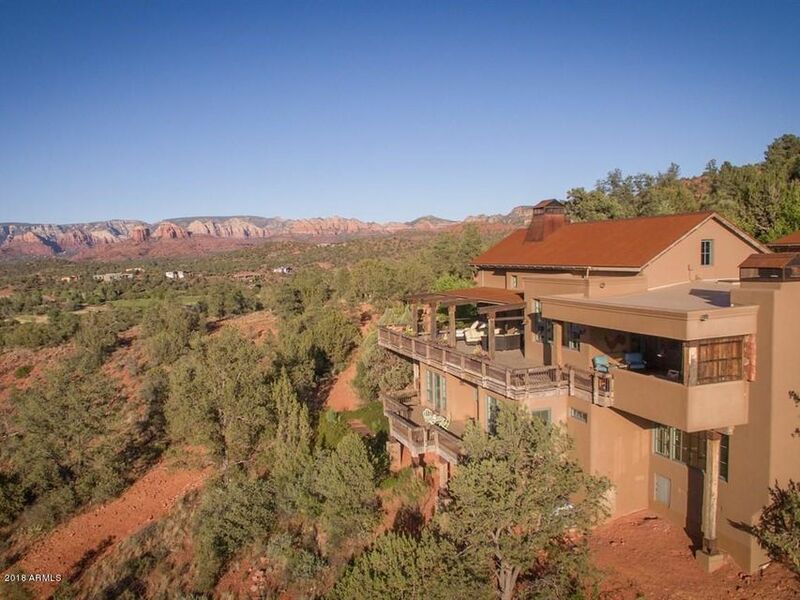 This glorious estate backing to national forest includes spectacular red rock, mountain, creek & forest views. Perfect short term rental and/or family retreat. Secluded behind private gate with a wall of surrounding wilderness - this 2/3 acre Chalet sits off of Highway 89A for very easy year round access. The sound of the creek's tumbling water alone at night in all "
"An exquisite architectural gem with luxurious finishes and bathed in panoramic red rock splendor. 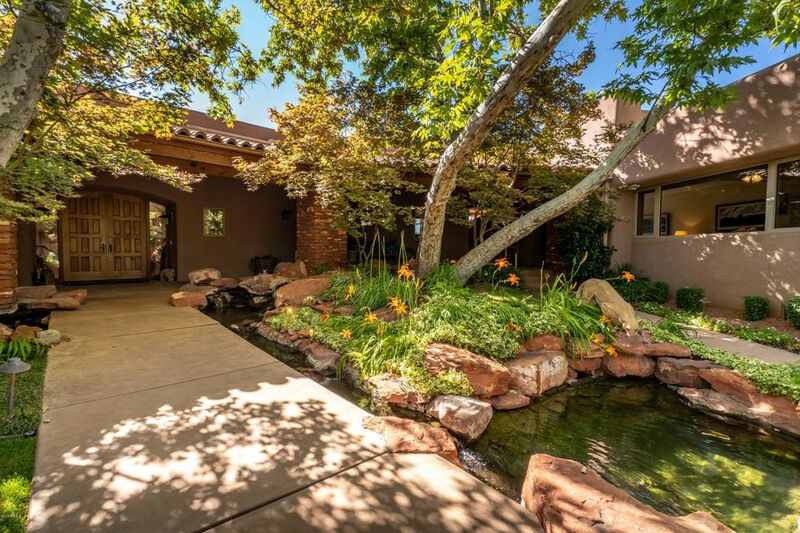 All in a perfect West Sedona location. Everything about this home bespeaks sophistication, elegance, and top-of-the-line quality - from the innovative design to the gorgeous stone flooring to the magnificent lighting to the Viking appliances. The kitchen is a gourmet chef's delight. The master bedroom suite is sumptuous - complete seclusion, on its own level with two commodious closets and great vie"
"Looking for 4 Acres, Privacy & SINGLE LEVEL Living W/ INCREDIBLE VIEWS ? Look no further...Sun Ray Homes 2006 home gently lived in with no need for improvements. Nearly 3000 sq ft livable offering 3 bdrms + office, 3 baths, oversized 2 car garage with dog washing station, & a separate wine room/studio below the house for the wine enthusiast or hobbyist. 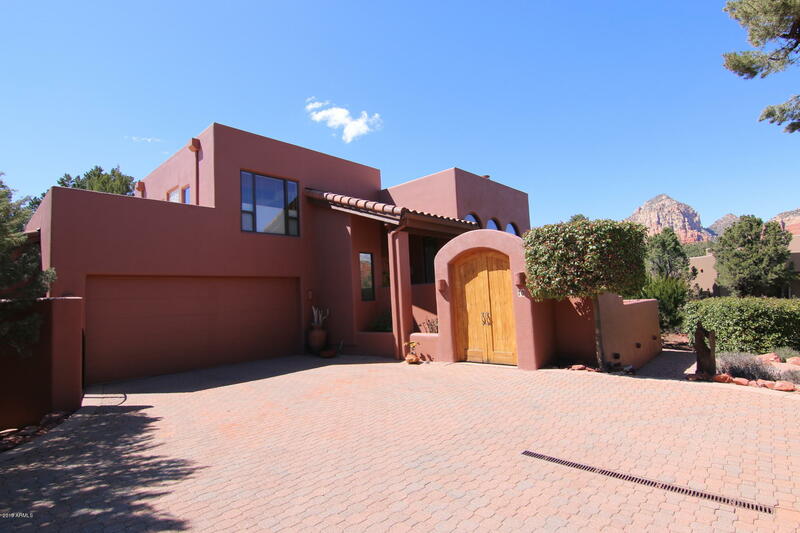 Beautifully appointed w/ wood floors, knotty pine baseboards, wood beamed ceilings, slab granite counters in gourmet kitchen, travertine counter"
"At the foot of Standing Eagle Rock (aka Coffee Pot Rock), this luxurious sanctuary offers both privacy and stunning red rock views. Situated on a generous and verdant .87 acre lot with an abundance of shade & fruit trees and an impressive organic garden, this lovely home gives you the feeling of serenity, elegance, and seclusion. From inside, no other houses are visible. With the enchanting master suite, gourmet chefs kitchen, exquisite dining and living rooms, bathed in natural light, wonderful"
"Open the gates to your private courtyard and meander into a soft SW contemporary featuring massive windows that frame AMAZING RED ROCK VIEWS! Soaring Ceilings and gas fireplace in your open Great Room. A Chef's Kitchen awaits you with rich granite counters, Subzero fridge, VIKING wine fridge, Dacor microwave/ VIKING 6 gas burner range, VIKING wall oven, Asko dishwasher & fireplace that can double as a pizza oven. Check out the walk in pantry AND additional walk in dish pantry. Main floor living "
"The perfect vacation home or, even better, your year-round residence, if you love Nature, magnificent panoramic views, privacy, & gracious living. Situated at the end of the road on a generous .56 acre lot bordering the U.S. National Forest, this supremely comfortable, light & airy home boasts extraordinary decks & outdoor entertainment areas high above a marvelous arroyo with dramatic waterfalls after a rain. Every room in the house catches a view of the red rocks & abundant foliage. It's the i"
"Escape to Red Rock Country and enjoy the serenity found at 2 Chrysona Lane in Michaels Ranch. 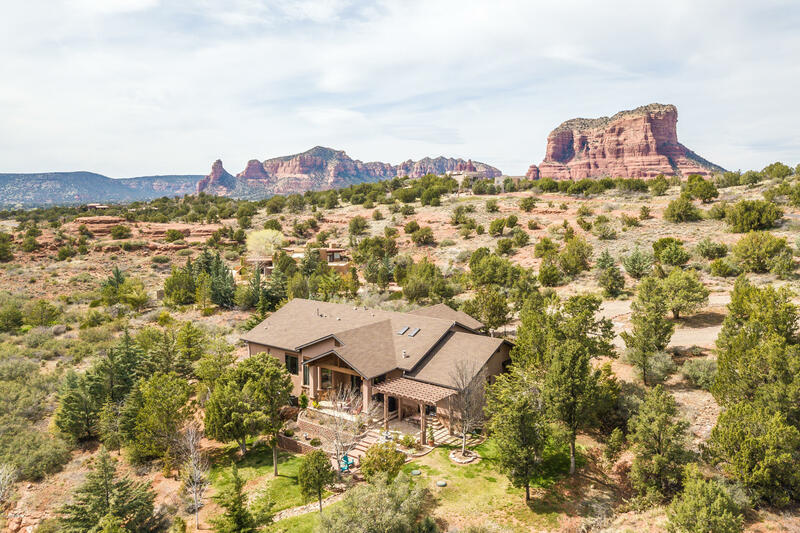 Located just minutes from West Sedona, yet close to Red Rock State Park, this home is the perfect place to relax and take in the best of the west."